Chain Conveyors are an essential part of many bulk handling systems, where they are used to convey bulk materials such as powders, grains, flakes, pellets …etc. Many of these conveyors use drop forged chains with flights as a means of conveying the material being handled. This “en-masse” conveying system is very popular as it is a simple but highly efficient system of moving material. When it comes to purchasing a chain conveyor, it is easy to look just at the one-time purchasing cost and the quality of the components. The problem with conveyors is that they are exposed to a lot of wear and tear, and even the best chains can fail after a certain period of time. But this can be many years depending on the conveyor use and maintenance. If we look at the lifetime cost of an en-masse chain conveyor, we’ll find that a big part of this is the maintenance: the cost of replacement chains and links, the cost of the labour and finally the cost of the downtime. For each and every user of chain conveyors, it is of vital importance to have the conveyor running to full capacity for as long as the equipment can allow it. Maintenance and repair can cost a lot of money and time, usually requiring the services of a team of engineers and considerable amount of resources. So how does the en-masse conveying system work, and where does the chain failure occur? In En-Masse conveying, the flight height can be as low as 12.5% of the material being transported in the chain conveyor. The material is fed into the conveyor from the top and falls through the moving chain to the bottom of the box. 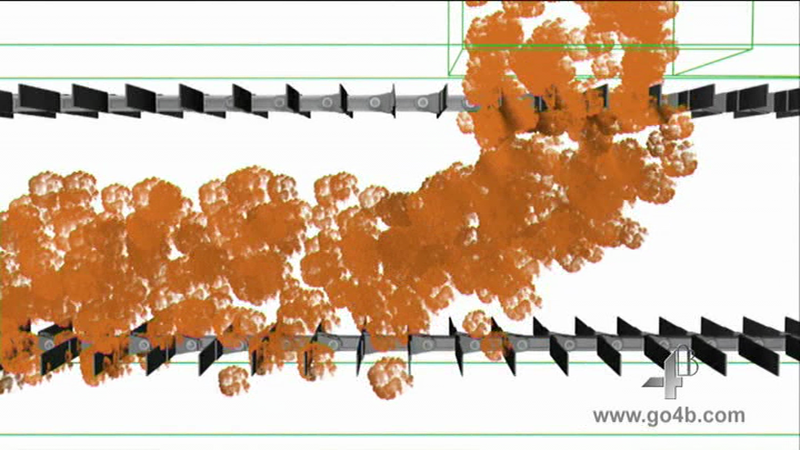 Because the particles interlock, the material moves as a single stream at the same speed as the chain. This highly efficient conveying process allows nearly the entire conveyor cross section to move as bulk. Traditionally, the flights are made of steel and welded onto the links. The links with flights are then assembled in many different arrangements using pins and circlips, headed pins and circlips or headed pins with collars and a roll pins. The whole assembly is very robust and works well until general wear, operational errors, material build up and many other reasons can cause maintenance shut down. 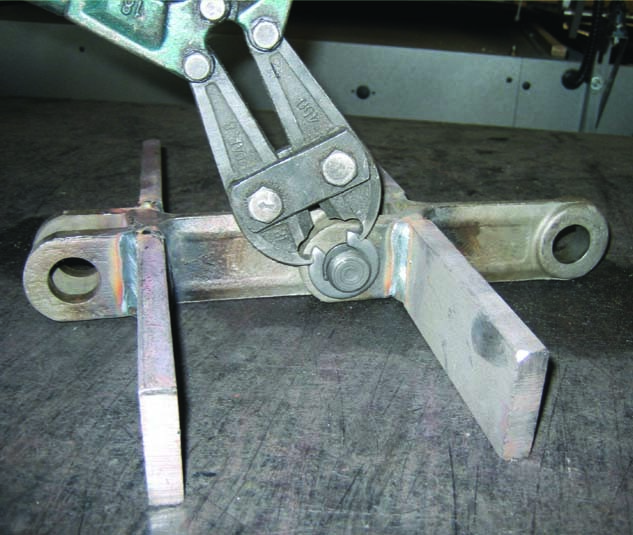 In the case of a minor incident, such as the flights breaking, although the chain does not require to be changed, it is still necessary to order new chain links with flights welded or grind the sides of the failing links and weld new flights onsite. In both cases, a lot of resources and time are needed to complete the maintenance procedure. Having new links with flights welded is only the first step of the maintenance process: the chain needs to be slackened, the circlips must be broken in order to take out the links where the flights have failed, new links with welded flights need to be put in, and finally the chain has to be tensioned again before the conveyor is at last operational or the whole chain removed from the conveyor. One of the other major causes for concern with this traditional assembly is the fact that the circlips can sometimes come loose due to poor installation, not only causing the chain to collapse therefore again stopping the conveyor, but also contaminating the product that was being conveyed and risking pollution and obstructions in the plant process. Engineers have been working hard at suppressing and minimising the different problems encountered within a chain conveyor as much as possible with solutions such as more frequent maintenance checks, metal detectors…etc. - Whilst this has helped to reduce the number of unexpected break-downs, it hasn’t removed the need for conveyor shut downs when the chains or flights need to be replaced. With 125 years experience and providing solutions, worldwide, to customers within the bulk material handling industry, the engineers at 4B have come up with a revolutionary simple solution that minimises conveyor maintenance downtimes and overcomes a lot of the problems encountered when using drag chain conveyors. A set of Nylon flights that can be cut to accurate lengths depending on the desired overall width. These nylon flights are very strong and wear resistant but remain light- weight, therefore reducing the amount of power required to drive the chain. A hollow pin made of alloy steel (the same material as the link) and case hardened to C57 - C62. This pin will take the load in the assembly. It is very strong and can be supplied in stainless steel for applications in a corrosive environment. Bolts, nuts and washers are used to hold the flights onto the link and assemble the links together. Lock nuts are used to secure the whole system. At no point does the bolt take the load or is in contact with the pin. It merely holds and secures the flights. The system uses 4B drop forged chain links that have special lugs on the sides onto which the flights are fastened, giving the assembly extra stability. 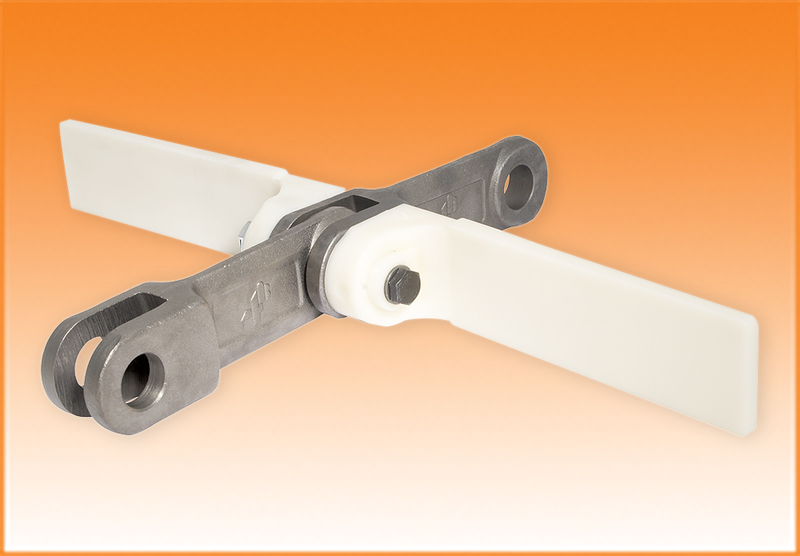 The Bolt ‘N’ Go system is extremely easy to install, yet very robust and has a long lifespan. It has many advantages in comparison to the traditional pins and circlips assembly. This system will undoubtedly save a precious amount of time and money when conducting maintenance work. 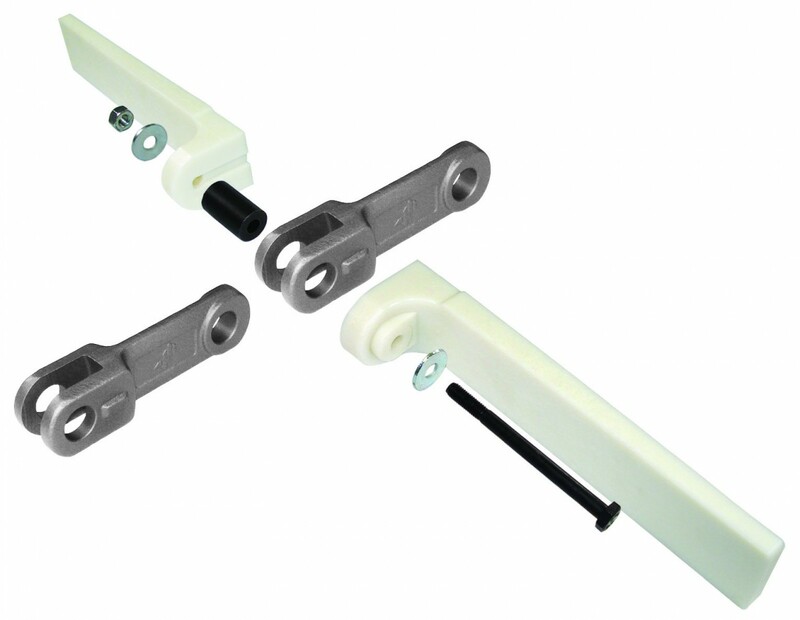 With the Bolt ‘n’ Go system, it is no longer required to take the tension out of the chain and take the chain out of the conveyor before changing the flights; the old flights can be taken out and new ones fitted while the chain is still tensioned inside the conveyor. Since a shorter amount of time is required to assemble the Nylon flights rather than welding steel flights onto links, all the flights can be delivered very quickly thus eliminating the need to stock a lot of spare parts; or they can be kept in stock on site at low cost, since they are not welded to the chain. The Bolt ‘N’ Go system will also enable the full use of the links since it is not necessary to change the links every time new flights are needed. Once again this represents a major saving for facilities using this system. 4B's Bolt ‘n’ Go chain links are made of special heat treated alloy steel case hardened to Rockwell C57 - C62 with a ductile core hardness of Rockwell C40. 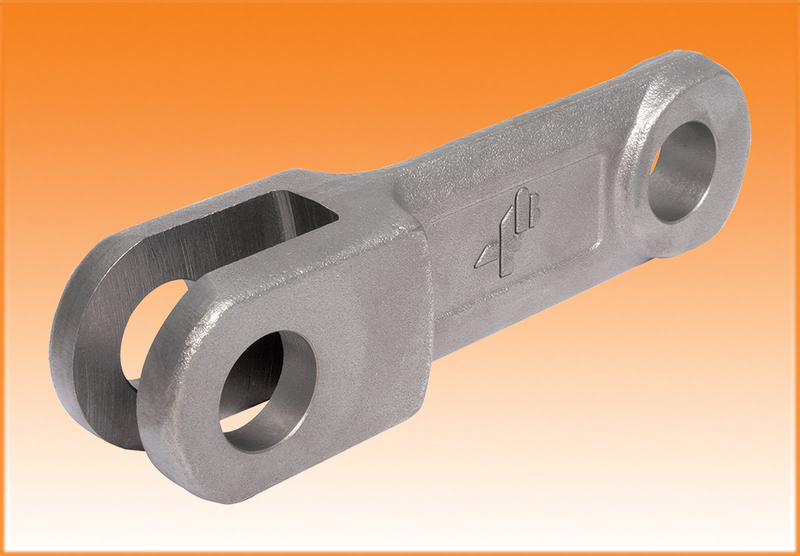 4B’s superior heat treatment technique and material provides the optimum chain link with a more resilient ductile core for shock resistance, and an extremely hard exterior surface for superior wear and corrosion resistance. This results in reduced downtime and maintenance with an increase in the working life for the chain conveyor. The Bolt ‘N’ Go assembly system is an excellent and robust solution that will not only improve the overall capacity of the conveyor to perform at its optimal ability for longer. But also help to minimise the offline maintenance periods thus improving the yearly capacity and profits made using the chain conveyor. The Bolt ‘n’ Go system has been used successfully in many facilities across the world, in a wide range of applications including agricultural, wood chips, sugar, animal feeds, etc. All these products have been used in conveyors of various length, angles and high capacity applications. The system has been such a success that many suppliers of en-masse chain conveyors now offer the Bolt ‘n’ Go chain and flight system as an option. 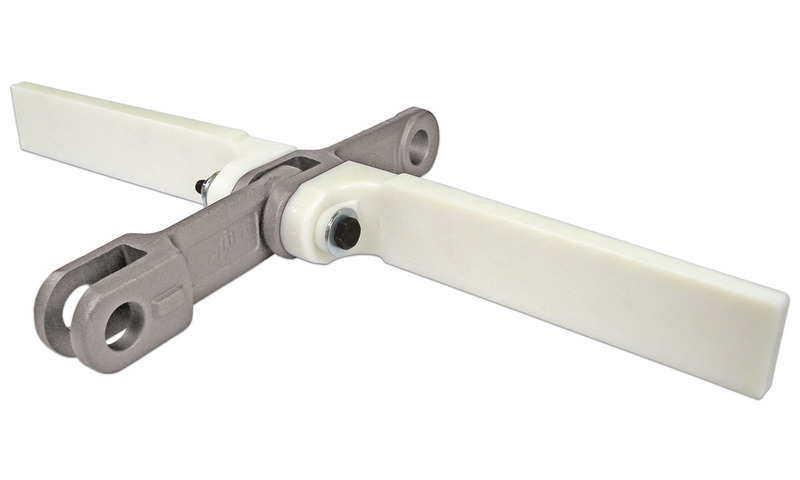 Bolt ‘n’ Go is currently available for 4B102NA, 4B142NA and 4B142HA links with flights up to 750mm wide. 4B’s drop forged chain is backed by an international network of companies with over 125 years of bulk handling experience. 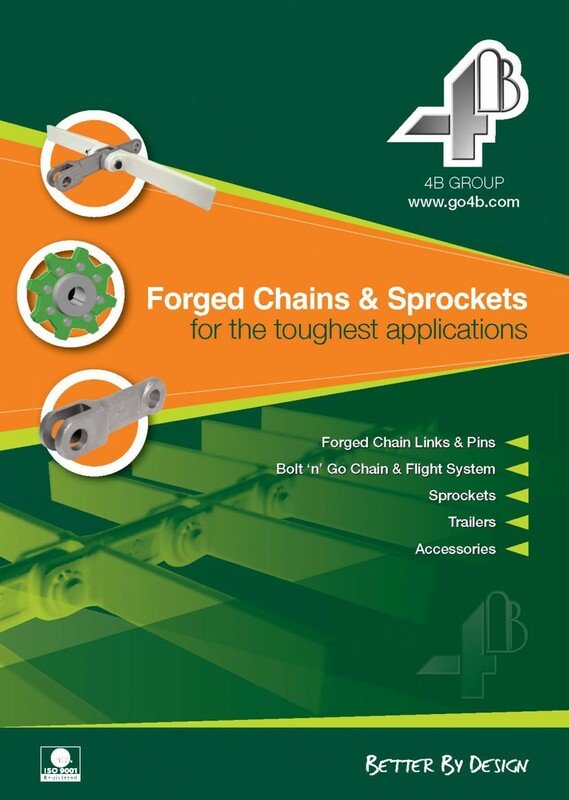 4B engineers are specialised in the drop forged chain industry and can provide engineering design service and advice for any drag or en-masse chain conveyor application.